LEN - www.lankaenews.com | Fearing the sanctions to be imposed against MARA –SIRA junta , Parliament opening date advanced to 7 th ! A victory for Democracy!! (Lanka e News -02.Nov.2018, 11.30PM) The grave violation of constitution committed by MARA –SIRA junta by creating two prime ministerial posts without showing any concern for the laws of the country , economy and country’s future has precipitated an unprecedented crisis . With the civilized countries of the world getting ready to impose sanctions in the circumstances ,MARA –SIRA junta had got frightened so much so that it has now relented . It has now decided to re convene parliament earlier , that is on the 7 th . The synthetic prime minister MARA who knows nothing about laws and lofty traditions but only knows how to create murder and mayhem in the country had not known even the new date. Addressing a media briefing today , he said , the date of re opening of parliament is 5 th of November thereby demonstrating the difference that exists between the synthetic P.M. and the official P.M.
Based on reports ,the date issue was the result of nekath time (astrological beliefs) . 5 th suits MARA while 7 th suits SIRA on auspiciousness. Finally SIRA has decided to make 7 th the parliament opening day , but that day is undoubtedly going to be doomsday and most inauspicious for Mahinda –the day synthetic P.M is going to be a record breaker as the P.M. who held that post for the least number of days – just five days, when he fails to show his majority members(113) in parliament .. While the FUTA of the University lecturers federation the legal body has issued a communique condemning the illegalities committed by MARA –SIRA junta, yet MR convened a meeting inviting a group of MARA- SIRA junta’s lickspittles and told them the parliament is being convened on the 5 th. It was clearly manifest at the media briefing the conduct of MR betrayed his state of distress and desperation due to his failure to muster the necessary majority in parliament .The confidence his body language displays on other days was totally absent . Meanwhile owing to the conspiratorial and unlawful actions against the state of MARA-SIRA junta and their utter unconcern for the country’s interests while only pursuing their personal agenda of evil power perpetuation , during the last four days , the SL rupee has depreciated by Rs. 4.00 against the dollar. Today the value of a dollar is Rs. 177.00. The IMF which was to grant US dollars 7 billion on the 31 st of October to Ranil Wickremesinghe in order to offset the rupee depreciation had been suspended owing to this traitorous conspiracy of the MARA-SIRA junta. This means the rupee is going to depreciate further in the future. 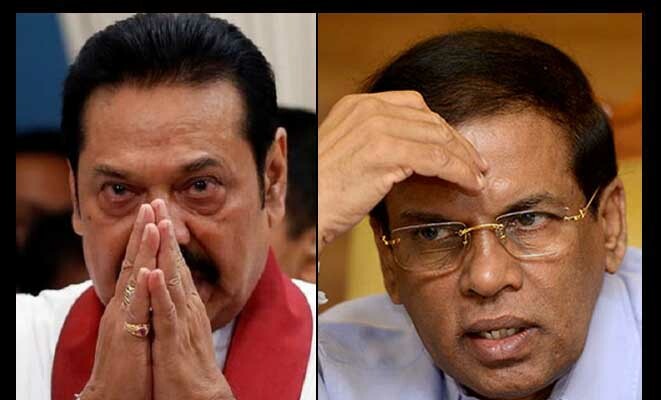 Meanwhile the United Nations representative for SL has met with Sirisena yesterday and warned if the country is going to be plunged into further economic doom and gloom by not re convening the Parliament, various sanctions may have to be imposed on MARA –SIRA junta. It is after the junta becoming apprehensive following the threat , the date of re opening of parliament scheduled for 16 th was advanced. Meanwhile Official Prime minister Ranil Wickremesinghe this morning making a statement to NDTV Television channel revealed , the ability to successfully advance the date of re opening of Parliament which was originally fixed for 16 th is a great triumph for Democracy .